Data is the currency of mobile marketing. Without it, you’re broke. The deeper you dive into the data to extract insights, the richer you can become. When we explore data, we often refer to two types: aggregated and raw. Why do you need these seemingly endless rows and columns of numbers upon numbers if aggregated data on the dashboard already ties it all together? After all, insights are gathered from patterns, not specific users. Here’s why: Aggregated data, like the data you’ll find on the AppsFlyer dashboard, is obviously highly valuable. It’s clear, easy-to-use and offers actionable insights, fast. Important as it is, it’s not enough. You also need data in its purest form — raw. And you should be able to get it even if you can’t handle a real-time data transfer through a push or pull API. For example, by simply downloading an excel file from the dashboard. Starting with a bang here as this one’s the most important reason to have access to raw data. Simply put, it gives you the ability to create highly targeted lists of users that you can use in your retargeting and lookalike campaigns. For example, you can create a list of IDFAs of consumers who viewed products but didn’t buy, or if you are running with a retargeting network that is able to receive rich in-app events (we support transferring the data from our end) – players who passed level 25, have made at least 1 in-app purchase, but have been inactive for at least four weeks. As in-depth as aggregated data is, you may want to run your own data analysis that is customized to your unique needs. With raw data at your fingertips, you or your BI team can mold it in any way, shape or form to get deep insights into your different audiences, their behavior and lifetime value. In our complex mobile ecosystem, install discrepancies are a fact of life. Whether discrepancies with networks or with app stores, there could be 1,000 different reasons. Different measurement methods: An advertiser receives an invoice from Network A that billed him for 10,000 installs but AppsFlyer data shows only 8,000. He then downloaded the raw data report from the dashboard and was able to determine the 2,000 disputed installs we’re divided among other networks that got the last click. The main reason for the discrepancy is a result of different measurement methods. Network A credits itself with an install when it matches between a click and an install. However, it has no way of knowing what came after its click because its view of the conversion path is limited to its own interactions – not the ones of other networks. Ultimately, in such cases you need to decide which method you’re going to run with. As an established and unbiased attribution authority that’s trusted across the ecosystem, AppsFlyer’s numbers usually stick. Technical problems: The advertiser sees installs in the AppsFlyer dashboard but the network does not because it’s not getting any postbacks – prompting it to freeze the campaign. In such a case, the advertiser can filter the raw data logs to pinpoint the problem – whether a setup issue or configuration error – and make the necessary fixes, or a communication malfunction to further probe. App store measurement is on a per user basis, not per device. That means that if I used the same Gmail account to download an app on my phone and tablet (or family members used my account to download the app on their phone), the store will only measure 1 install while AppsFlyer will count each device as its own install. The app store will count 1 install even if a user installed, uninstalled and then installed an app again. AppsFlyer will count 2 installs if a reinstall occurs more than 3 months after the first install. When advertisers start working with us and we don’t have historical data, we will count an install if a user upgraded an app version whereas the appstore won’t. App store numbers cannot be disputed. The only thing that can be done here is to understand what led to the discrepancies. A report by White Ops digital security firm puts the price tag of web advertising fraud at $6.3 billion. Although there’s still no hard data on the extent of fraud on mobile, it’s estimated that it will cost mobile advertisers at least $1.5 billion this year. So clearly this is a big deal in mobile as well, and will only become bigger as mobile budgets continue to shoot up. There are many ways to fight fraud. Assuming we’re talking about a savvy fraudster who can create a different identifier for the same device, you’ll be able to use the raw data to fish out suspicious patterns. For example, you’ll be able to pinpoint that many installs or unique identifiers from the same IP, illogical time stamps (every second, every 5 seconds etc. ), or many IDFAs for a single IDFV (identifier for a vendor). You can tie in attribution oriented raw data from your attribution provider with your own raw data models and business logic. This will enable you to re-engage with users in the network that acquired them. For example: prompting a user that was acquired through a Twitter campaign to tweet about your product. Setting a real-time data transfer via a push API has tons of benefits so it should come as no surprise that it is used by the savviest marketers. But what happens if you’re getting this data from an attribution provider and the communication is down? The answer: you lose all the data for that period. 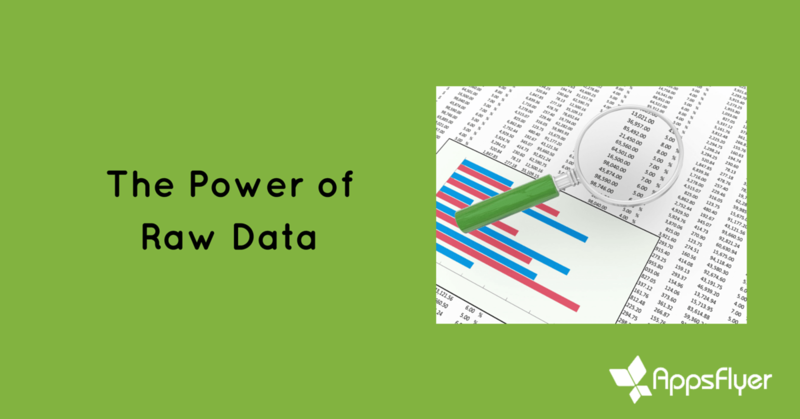 Having the option of downloading raw data for a given period from the dashboard will prevent any loss of data. Raw level data gives you freedom. With it, you can take your valuable data with you and move on to another vendor if you wish. Without raw data, you’re de facto chained to a specific vendor that has all your data. This may sound obvious but to many it is not – the data is your data and it is your most valuable asset. To squeeze all the juice from your data lemon you need to get all the data logs – ideally via an API transfer (if you support it) and / or a direct access from the dashboard to cover all your bases in case the line is down.